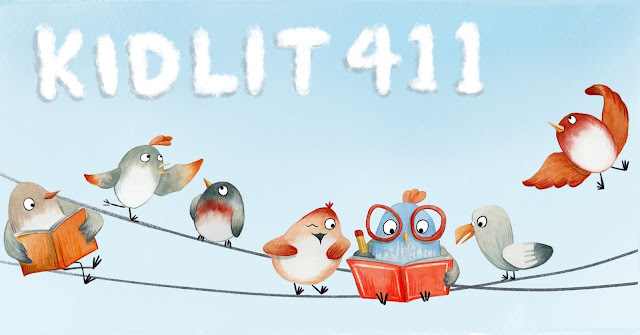 Today we are excited to feature illustrator Hui Li, who won first place in Kidlit411's banner contest! Her winning entry will be displayed on our website and Facebook group for the month of March. Tell us about yourself & how you came to illustrate. I am always driven by curiosity. When I was four, I saw someone performing writing with a giant soft brush on thin paper. I didn’t know how to write at that time, but I was totally attracted by the flow of lines. “I want to learn that!” I went home and begged my mother. Soon I became an apprentice of this art of balancing. When I was older I began to learn perception and composition from my father, who was a professional photographer. Visual art has become an indivisible part of my life ever since. In college, I became fascinated with the driving force of the universe and majored in science. Graduate study took my knowledge on this aspect to a slightly deeper level, yet I realized at the same time how much I didn’t know. The laws of physics can or have the potential to explain a large number of phenomenon, but not necessarily how human society works. So I began to explore it through an interesting way — my paintings. Very soon I found out while I was painting, I like setting up environments, giving clues to describe a concept or an event, and sometimes with fun characters. It naturally led me to illustration. 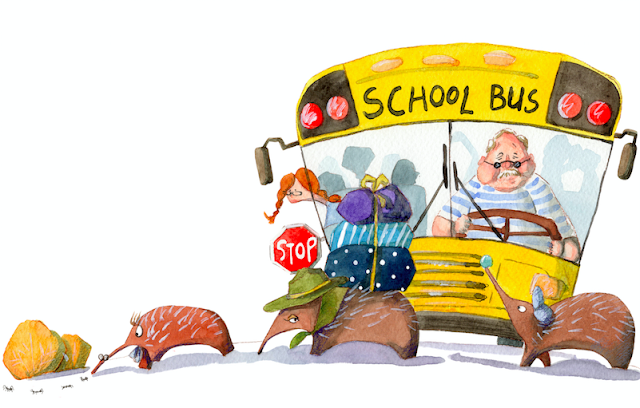 More specifically, illustrations for children’s literacy. I was immediately lost in this creative world. 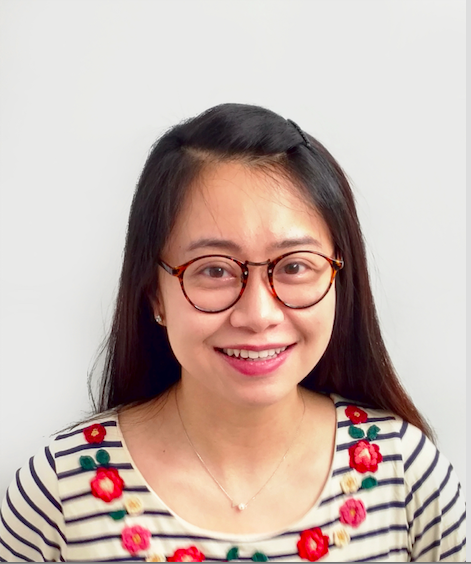 It is a great fit for my interest in visual art, my personality, the fact that I’ve been writing and publishing stories since childhood, and the hope that I can one day introduce kids to an amazing world from a different perspective. Imaging all the great things we can do with children’s books! After taking several classes, I decided to move to NYC and began this exciting journey. You have a PhD in Computational Chemistry. How does your science background influence your creating process, if at all? Computational Chemistry is an interdisciplinary field in which we develop and use computational techniques to answer questions in science. Yes, it definitely influenced my creating process. It’s like carrying experiments. Collect information, generating draft, revising for several iterations until the picture works. I ask a lot of questions. If I get abstract feedbacks such as “it feels good/weird”, I will go a step further to find out the exact reason, so that I can work more on my weakness intentionally. I also like summarizing. There was a time I was quite confused about what makes a good children’s book. So I checked out hundreds of books from local library and wrote reviews to delineate why or not the illustration/story works, then compared my reviews to those on GoodReads to see what I failed to consider. It’s been very helpful for my creating process, as the guidelines in my head is getting more and more clear. 3. Congrats on winning our banner contest! 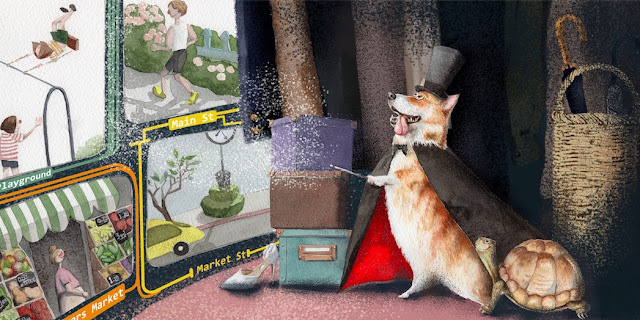 How do you approach an illustration assignment like this one? Thank you! I think I am really lucky, because there are so many great pieces in the contest showcase. For this project, I started by thinking about the function of the banner. A few factors I considered include the mission of kidlit411.com and the user groups it serves. To illustrate them I had birds chitchatting, reading, writing and singing. I also wanted to give the birds personalities to make the banner visually interesting. Then I sketched digitally and played around with composition, characters and texts to see what would work. This is the stage where creativity happens and it is a lot of fun. Once I am good with the drafts, I tested on a small piece of paper the color palette and values. 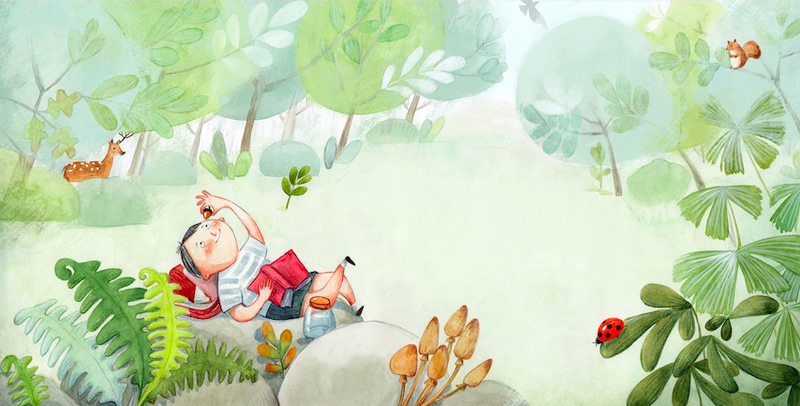 Then transferred the design to a larger scale illustration with watercolor and colored pencils. I made digital editing afterwards. What is your preferred medium and way of illustrating? I use watercolor a LOT, sometimes colored pencils, gouache and digital tools. I love the textures, the randomness and the surprises that traditional medium can bring. At the same time, I always have this battle going on in my head, as there is a voice telling me not to be too emotionally attached to one medium. Just to pick up whatever tool that is efficient and effective. Emm ... That voice also gives me the best excuse to stop at an art store and pick up new products! I recently illustrated several children’s science books called CURIOUS KIDS. A very fun project soon to be published in educational market by Nomad press. This January, I was very lucky to have my book dummies win the 2018 Writing with the Stars Contest (organized by Tara Luebbe), in the author/illustrator category. There is one book I am going to polish with my mentors Melissa Iwai and Denis Markell through the contest. I am also working back and forth between a few other stories and am constantly trying to improve my illustration skills. Congrats on all of your recent successes! What is one thing most people don't know about you? When I was doing research and examining molecules, I like thinking there are tiny creatures living on atoms, just like we live on earth. They send out signals to the “universe” to search for “aliens,” while the signals are too weak to detect by human technologies. I never told my colleagues as it is not so “scientific,” but sure it is a lot of fun to imagine! 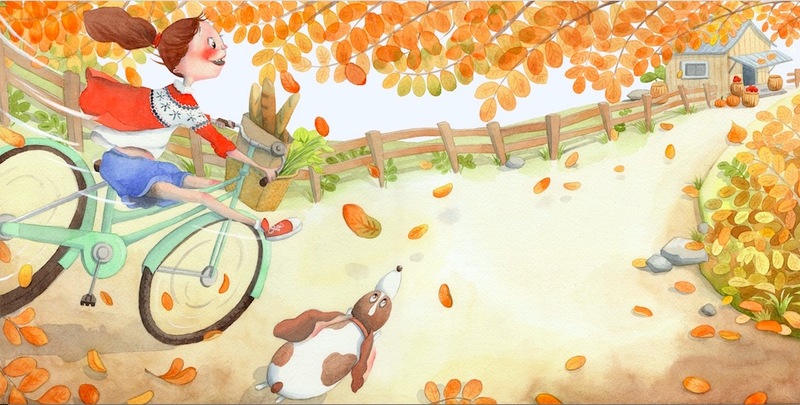 Hui Li is a children's book author/illustrator. She became an apprentice of Chinese traditional calligraphy since four and is ranked 9 dan (the highest rank). She had developed a strong interest of how particles/people interacting by practicing this art of balancing. Hui received a PhD Degree from the University of Chicago. She had published on world’s leading science journals, including Science and Proceedings of the National Academy of Sciences. With a profound understanding of the building particles of the universe, she wanted to explore more of the world with pens and brushes, and have positive influence on people’s daily lives. She moved to NYC to pursue this dream. 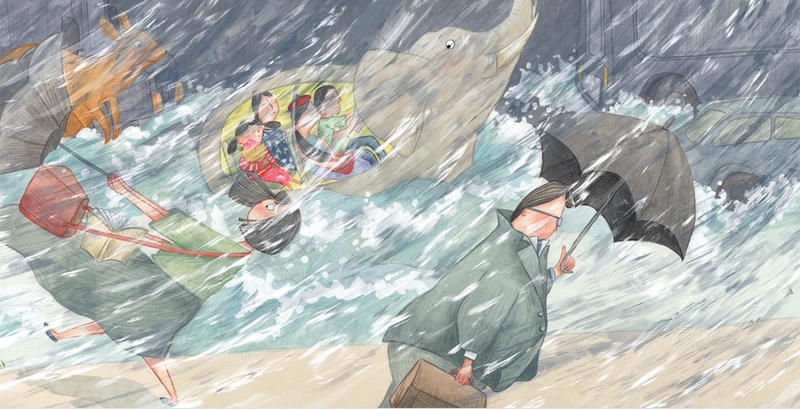 Hui is now devoted to writing and illustrating. 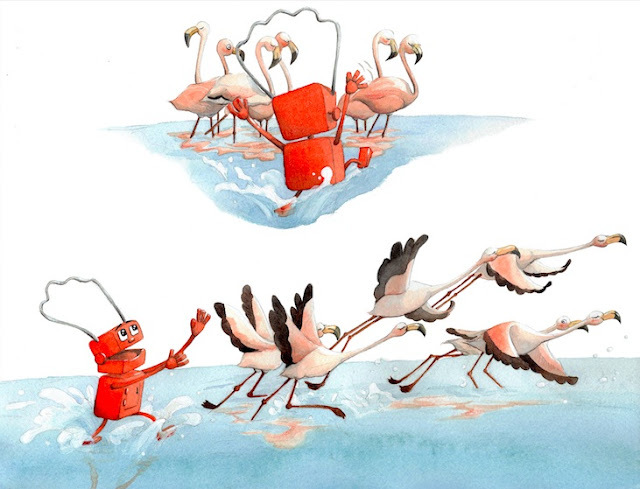 She had illustrated a series of science picture books for children. The book dummies she wrote won the 2018 Writing with the Stars Contest in the author/illustrator category. Hui’s apartment is full of succulent plants. Hui Li, your work is so well thought out and executed. You've had this inquisitive mind all along, and coupled with your imagination, and love of watercolor, I think you are a highly polished illustrator. Thank you for sharing some of your thoughts here. One question I have is - do you work digitally or traditionally with your watercolors? You have wonderful scenes that you create. Congratulations on your banner win here. Wow! Such beautiful and expressive work! Congrats on winning a Writing with the Stars Mentorship! And I love how you finally arrived at illustration by following your heart.